When you tell your kids it’s time for bed, they’re going to push that limit as much as possible. But, why not let a bed time “bouncer” enforce your rules by automating your kids’ routine with Stringify and your smart lights? 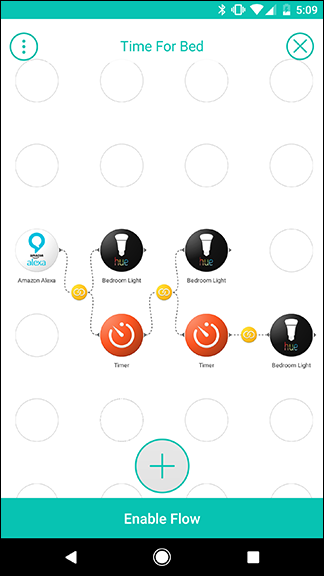 Stringify is a powerful automation tool that lets you tie all of your smart gadgets and online services together. If you’ve never used it before, check out our primer on it, and then come back here to build the Flow. 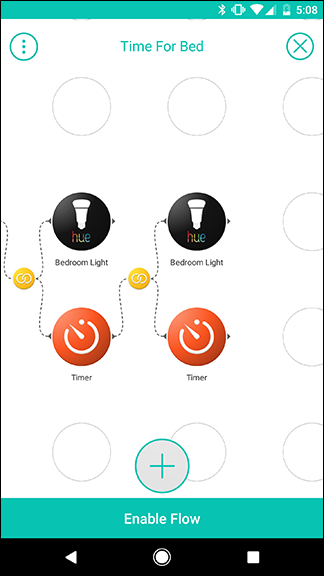 For our example, we’re going to use the Alexa, Philips Hue, and Timer Things. Our Flow will be able to start a bedtime timer using a voice command to Alexa. The timer will dim your children’s lights a little bit fifteen minutes before bedtime, then dim them even more five minutes before bedtime. When the timer’s up, the lights will turn off entirely. We’ll set up this Flow to only trigger when you activate it. This means you can let your kids stay up later on certain nights without throwing off the routine. 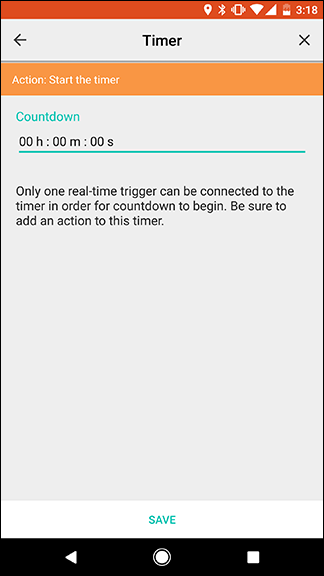 However, if you’d like to stick to a rigid schedule, you can replace the Alexa trigger with a Date & Time trigger and set this Flow to always activate at the same time every weeknight. 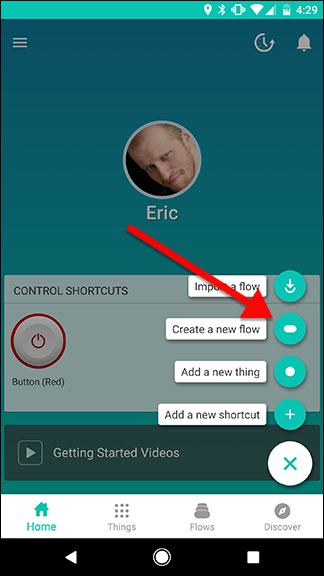 To get started, open the Stringify app, tap the round plus button at the bottom, and then choose “Create a new flow” from the popup list. At the top, tap “Name your flow” and give it a name. 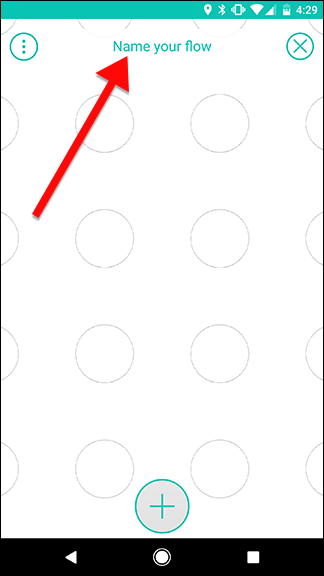 Next, tap the plus icon at the bottom of the screen to add your Things. 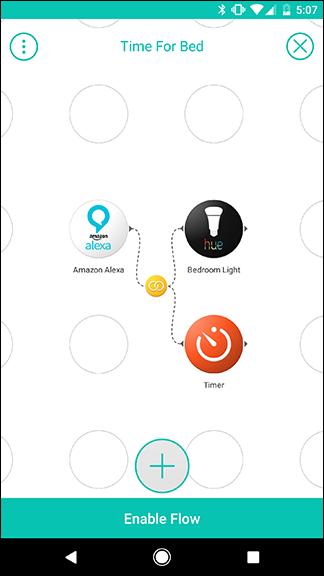 From the list, choose Alexa (or Google Assistant, if you prefer), your child’s smart light, and a Timer. When you’ve selected them all, tap Add at the top right of the screen. Back on the grid screen, drag the Alexa Thing out onto the grid. 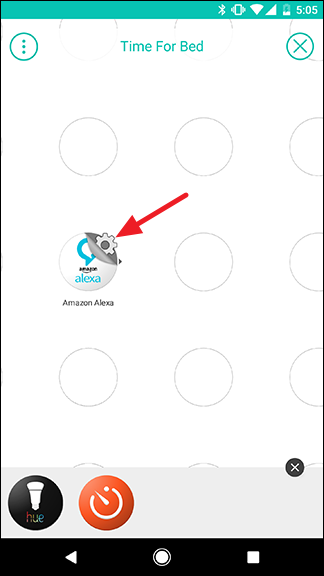 Then, tap the settings gear peeking out from behind the Alexa icon. 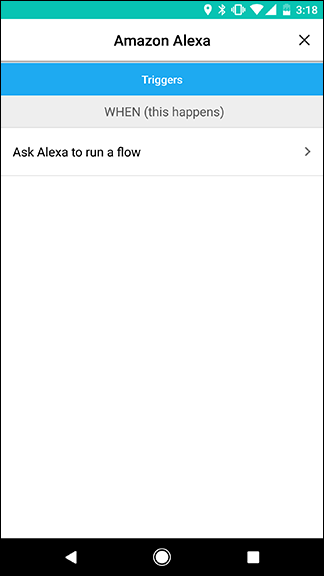 In the list of triggers, there’s only one item: “Ask Alexa to run a flow.” Tap it, then give your Flow a unique activation phrase. 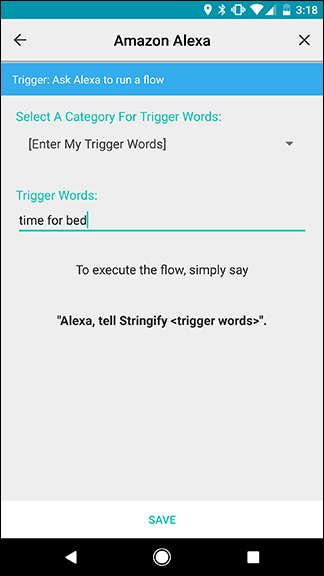 In our example, we used “time for bed.” When you want to activate your Flow with a voice command, you’ll say “Alexa, tell Stringify time for bed.” You can set up an identical voice command using Google Assistant if you have Google Home or would like to use the voice command on your Android phone instead. Back on the grid screen, drag your Hue (or other) light and Timer actions out onto the grid in the column next to Alexa, as shown below. Tap the settings gear next to the Hue action. Back on the grid screen, tap the settings gear next to your Timer action. Under the list of triggers, tap the “Start the timer” action. 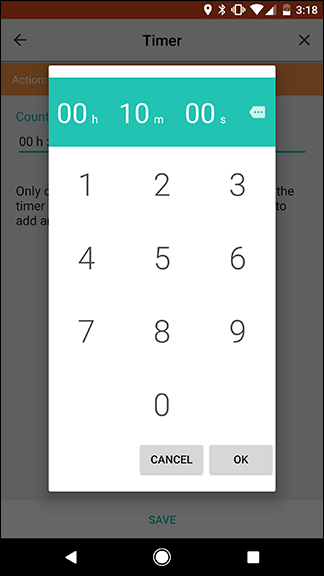 Tap the Countdown box, set the timer for ten minutes, and then tap Save. We’ll start another timer for five minutes after this one is finished for a total fifteen minute countdown to bedtime. 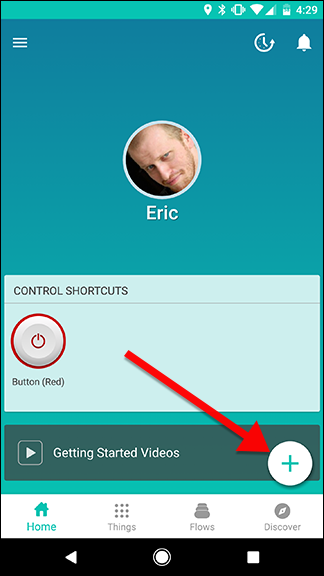 You can adjust your timers as necessary for your routine. Back on the grid screen, it’s time to start creating your flow. 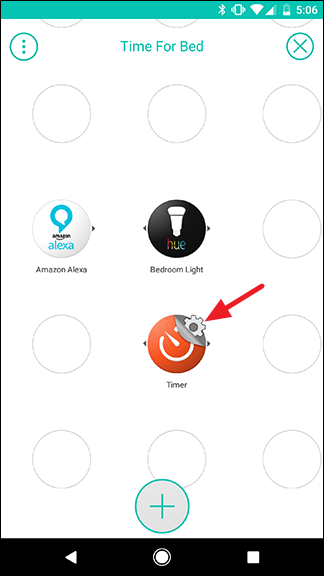 Swipe from the Alexa icon to the Timer icon to create a link. 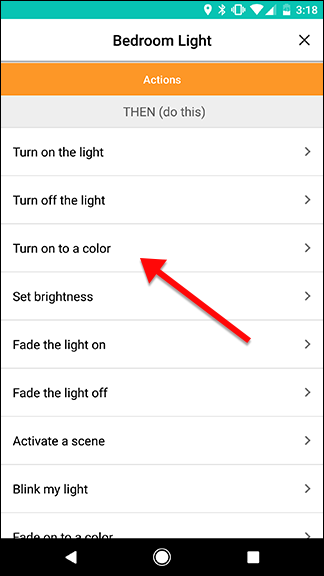 Next, swipe from the Hue icon to the yellow circle in the first link you just created. The result should look like the second image below. 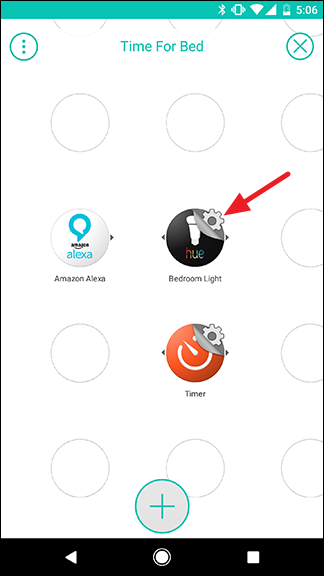 This will cause the Alexa trigger to activate both the Hue light and the Timer at once. Now it’s time to add a couple more actions. 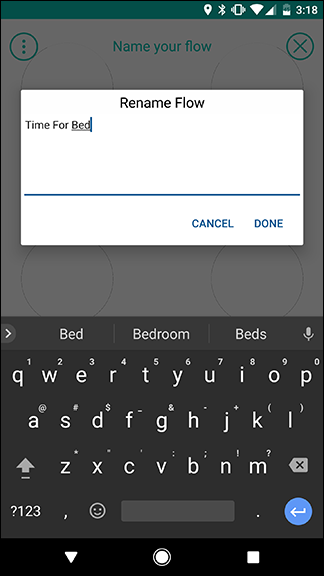 Tap the plus button at the bottom, choose the bedroom light and Timer Things just like you did before, and then drag them to your grid so they’re arranged like the image below shows. 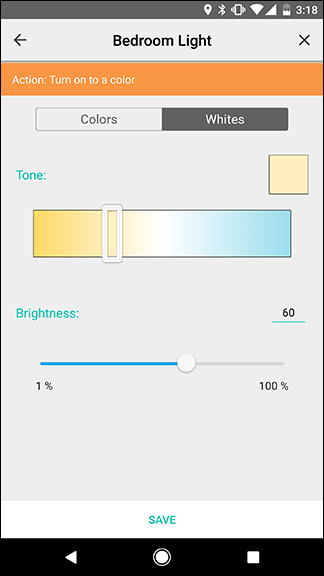 When you’ve added them to your grid, tap the settings gear for the new Hue light action. 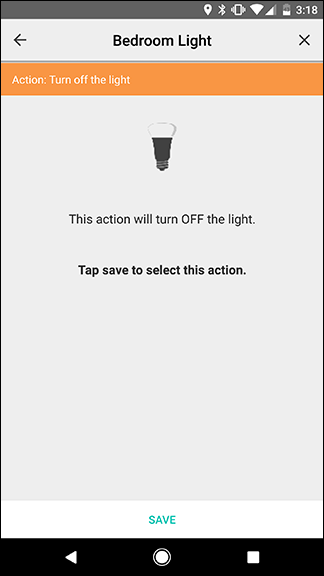 Back on the grid screen, tap the settings gear next to the second Timer action. Choose the “Start the timer” action, just like before. This time, set the timer for five minutes. Tap “Save” when you’re done. Back on the grid screen, connect the first Timer action to the second Hue action by swiping between them. 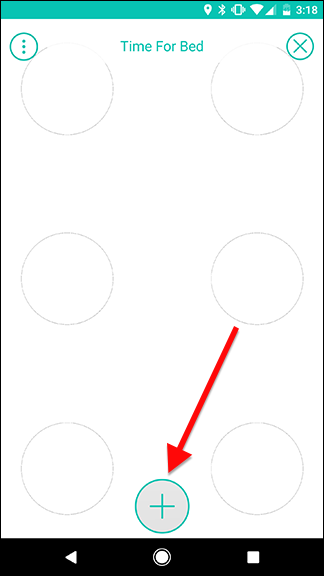 Then, swipe from the second Timer action to the yellow link you just created, as shown by the arrows in the image on the left. The result should look like the image on the right. 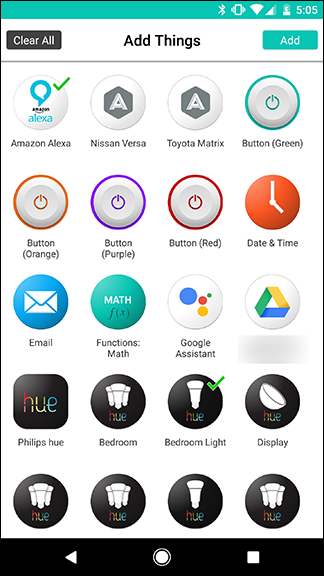 To cap it all off, we’ll add one more Hue action. 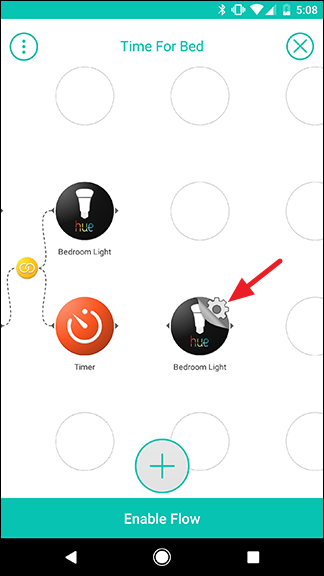 Tap the plus icon at the bottom and add the bedroom light Thing just like you’ve done before. Drag it to the grid next to your second timer, as shown below. 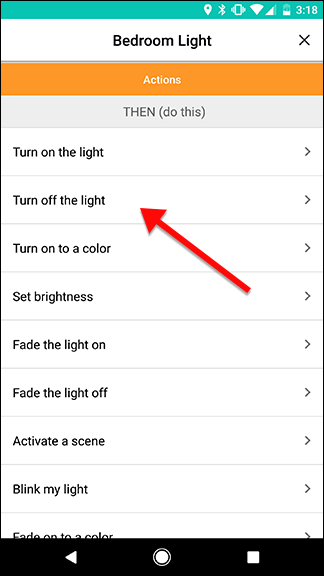 Then, tap the settings gear next to the new Hue light action. Back on the grid screen, swipe from the second timer to the last Hue action to connect them. The end result should look like the image on the right. Finally, tap “Enable Flow” to turn the whole thing on and finally get your kids to go to sleep. Now, whenever you want to kick off your kids’ bedtime routine, just shout “Alexa, tell Stringify time for bed,” and your kids will have fifteen minutes before it’s lights out.